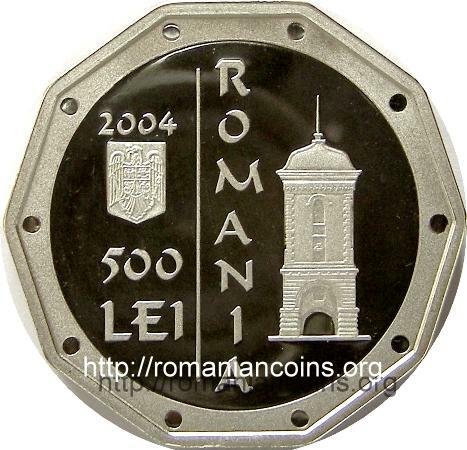 The pictures of the coin with the church from Cotroceni are present on Romanian coins through the kind permission of Mr. J. Ardelean. 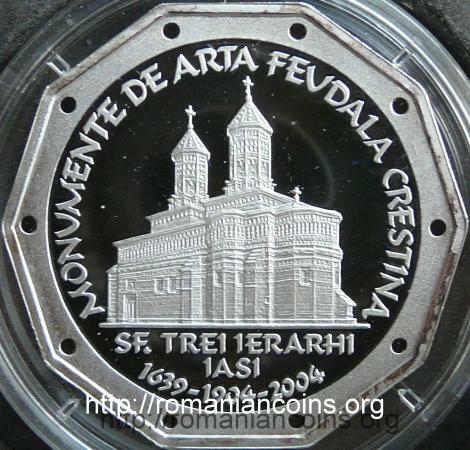 The coins belong to the series Christian Feudal Art Monuments. 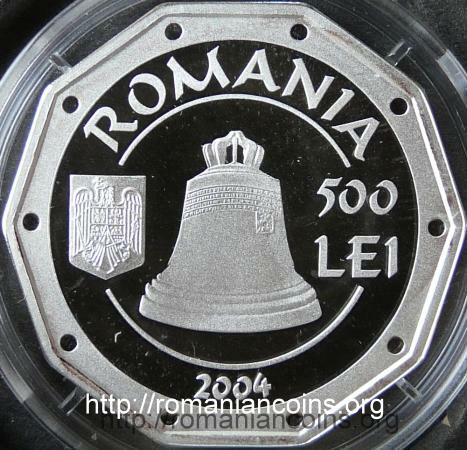 To the same series belong the 500 lei from 2002 gold coins with Bistriţa Monastery (from Moldavia), Mogoşoaia Palace and with Colţea Church, the 5 lei from 2006 silver coin with the wooden church of Ieud-Deal, three silver coins of 10 lei issued in 2008 with the monasteries of Cozia, Voroneţ and Sîmbăta de Sus, three silver coins of 10 lei issued in 2011 with the church of Strei and monasteries of Humor and Hurezi and the 10 lei 2013 silver coin with the wooden church of Rogoz. The Three Hierarchs Monastery was hallowed in 1639, being founded by Moldavian prince Vasile Lupu (1634 - 1653) (by the way, Lupu means the Wolf). Chronicler Miron Costin, in his work Letopiseţul Ţării Moldovei - Moldavia's Land Yearwriting, put down the event: "... in these parts was staying happy centuries and tranquility and peace being ensured of all parts, being now at peace prince Vasilie with the neighbours. And during these years prince Vasilie built praised monasteries, and here in the town of Iaşi, first under the names of three holy teachers of the Church, that are called Trieh Svetitelei ... ". In 1650, when the Tartarians and Cossacks burnt the city, "of the fire started was set ablaze the monastery also". At Three Hierarchs the relics of Saint Parascheva were kept for a very long time, brought from Constantinople by the founder. 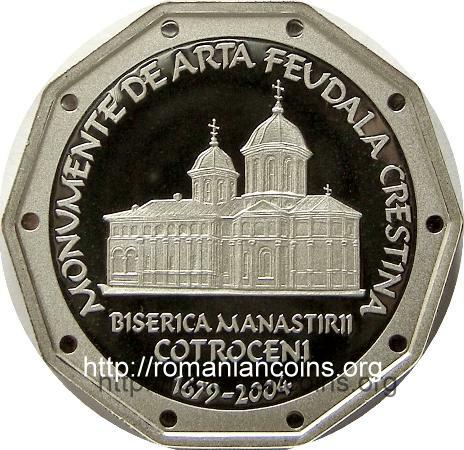 The Romanian historian Gheorghe Şincai write in his book "Chronicle of the Romanians” in the chapter of the year 1686: "He himself [king John III Sobiesky] has burnt two monasteries in Iaşi [Jassy], stolen ceremonial jewelry of the Church, taken the body of Saint John the New from Suceava, with all valuables, as many as they were next to him, that had been given by passed away rulers of Moldavia, and taken the metropolitan of Moldavia as captive, because he would not give him the sacred jewels. From here the king went to the monastery of the Three Hierarchs, where the relics of Saint Parascheva of Epibat are kept and commanded that the relics be given to him with all their priced objects. But the archimandrite of the monastery, learning what happened to the metropolitan, closed the church doors and responded to the emperor's harbingers that he would sooner want to burry himself under the debris of the church than give that treasure to any man in this world. The king, to frighten the archimandrite, ordered the cannons to be brought and boasted that he would bring down the church doors with them, and all that was would he take by force if the archimandrite, from his own will, would not give him a part of those relics but, the archimandrite having not agreed either, the king whether out of the shame, fearing that the word would go that he robs Christian churches, or counseled by his men, went away from there, without achieving his goal. Here, reader, it means that the king with his Poles have done, picking saint relics, just as those that now steal chervil, garlic and onion, in order to be able to fast the Saint Peter's Fast." The votive inscription of the church is: "With the will of the Father and the help of the Son and the conclusion of the Holy Spirit, here I, slave of master Lord and God and our saviour Jesus Christ and worshiper of Trinity, Io Basil [Vasile] voivod, by the grace of God lord of the Moldavian Land and with our lady Tudosca and the God given children, John voivod and Mary and Ruxanda, built this holy prayer, in the name of the holy three hierarchs Basil the Great [Vasile cel Mare], Gregory the Theologian [Grigore Teologul] and John Chrysostom [Ion Gură de Aur, meaning Golden Mouth]. And it was hallowed with the hand of archbishop Varlaam at 7147 May 6". The history of the Three Hierachs monastery was troubled. The church suffered several times because of fires and earthquakes. After the secularization of the monasteries' properties in the Romanian Principalities under prince Alexandru Ioan Cuza, (Vasile Lupu had subordinated his new foundation to Mount Athos in 1646), the Three Hierarchs monastery was closed. Restoration toils started in 1882 under the direction of French architect Lecomte de Noüy, the newly refurbished church being consecrated again in 1904, the year engraved on the coin. Since 1994 Three Hierarchs monastery was reestablished. At the Three Hierarchs a belfry existed (finished in 1638), but unfortunately about one hundred years ago the decision was taken for termination. The church served as princely burial ground, here being buried prince Vasile Lupu, lady Tudosca and the sons of the ruler. At the ending of Miron Costin's chronicle we learn that "And the bones of prince Ştefăniţă the boyars taking along with them [...] they came to Iaşi and entombed him in his father's monastery, which is recalled on the name of Trei Svetitelei.". 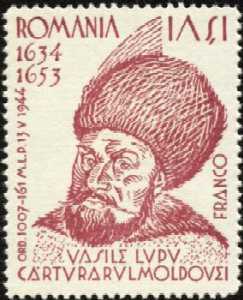 The later prince Ştefăniţă, son of Vasile Lupu, ruled Moldavia between 1659 and 1661. In the church of the monastery Three Hierarchs other rulers were buried, here being brought long years after their deaths scholar and prince Dimitrie Cantemir and Union Prince Alexandru Ioan Cuza. After , during the restoration of years 1882 - 1904, the old tombstones were thrown (along the content of the princely graves!). "From the objects existing in their graves, only the rings of lady Tudosca and of her son, John, were later found and recovered, on the bank of river Bahlui." In the print shop installed inside the monastery of Three Hierarchs - the first one in Moldavia - has appeared in 1643 the Romanian Book of Teaching - Cartea românească de învăţătură of Metropolitan Varlaam (known als as Varlaam's Cazania). Between the walls of the monastery the Academy of Vasile Lupu has functioned. Although the Academy was short lived, this foundation caused Vasile Lupu to be considered founder of superior universitary education in the Romanian principalities. In 1824 at Three Hierarchs an elementary school was opened, and a gymnasium later on, called Basilian, in remembrance of the first superior school founded here by ruler Vasile Lupu. Between 1851 and 1891 at Three Hierarchs a preparatory school functioned, for teachers. The three hierarchs of the Church are Saint Basil the Great (c. 330 - 379, bishop of Caesarea), Saint Gregory of Nyssa (the Theologian, the Speaker of God, c. 335 - c. 394, bishop of Cappadocia) and John Chrysostom (i.e. Golden Mouth, c. 347 -407, archbishop of Constantinople). 1. Grigoraş N., Biserica Trei Ierarhi. Meridiane Printing House, Bucharest, 1965. The Cotroceni Monastery was founded by Walachian prince Şerban Cantacuzino (1678 - 1688) in 1679. The founder patronized the edition of the Bucharest Bible, the very first complete Bible ever to be printed in Romanian. He was buried in his foundation: "... prince Şărban [...] had already died at October thirty and they buried him at Cotrocéni" - quotation from "Istoriile domnilor Ţării Rumâneşti - Histories of Walachia's Princes" of chronicler Radu Popescu. The church was brought to naught closely to our days, being demolished in 1984.